It's pretty common practice to squeeze a few dollops of silicon caulking in the channel and seat the rod side into that to eliminate rattles. Flat side against the fretboard. I've made some DIY wood filler with sawdust and wood glue, and it seems to get rid of the rattle when I put the flat side up... So maybe I'll use flat-up after all! If you find a little bit of rattle later, don't sweat it. Adding a bit of tension to the rod will take care of it. Not so much to actually move the neck, but enough that it snugs itself against both the bottom of the channel and the fretboard will stop any rattle. Next, I was thinking about gluing the fretboard ontop of the neck blank, then shaping the neck and headstock. However as with all things guitar-related, I have seen mixed opinions about this. Others say finish (fret & inlay etc) the fretboard separately, then glue it on at the end. 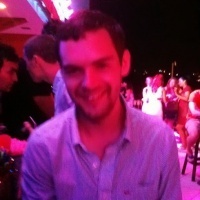 I can't see whether this would make any difference... Am I missing something? What about fretting the fretboard? Do people do that before gluing on or afterwards? 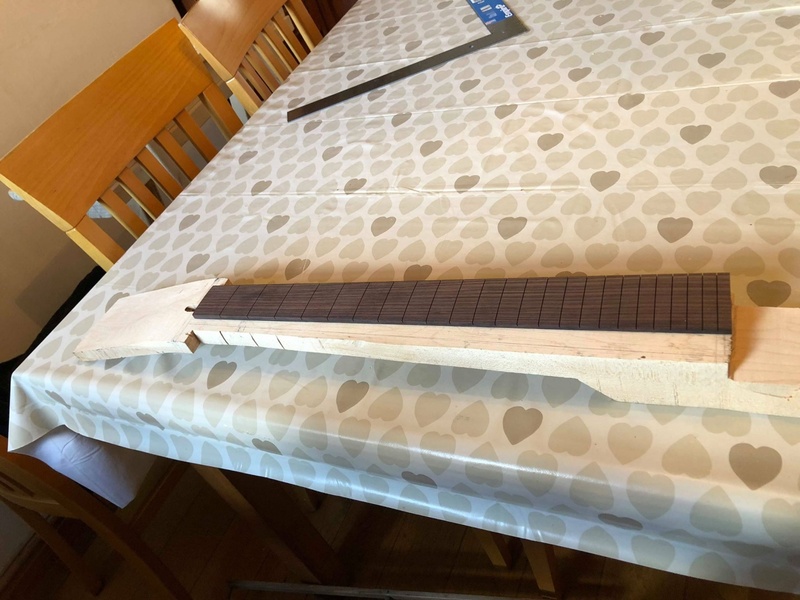 Easier to clamp the unfretted/unradiused fretboard to the neck while the glue sets up as there are no pesky frets and curved surfaces to deal with while clamping. 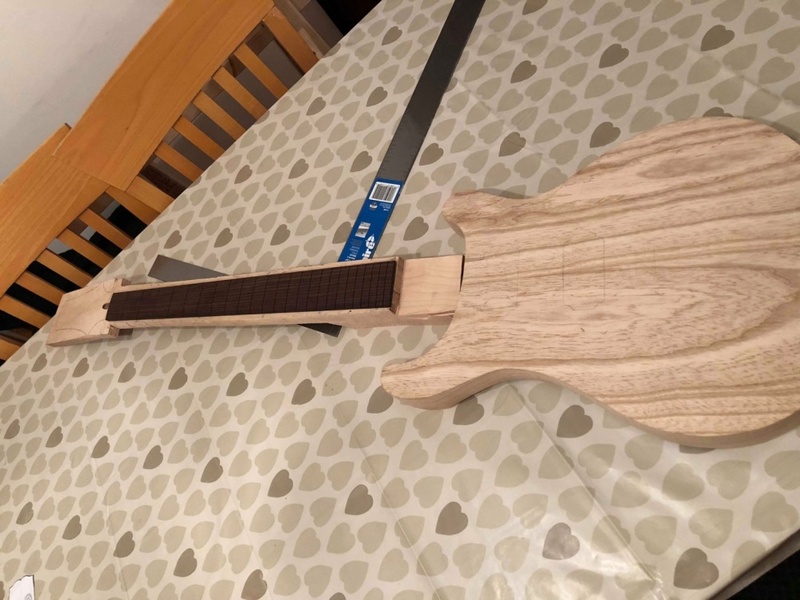 Some people also choose to leave shaping the neck until after the frets are installed as it means that the back of the neck remains a flat slab for as long as possible to help with providing a stable surface to clamp and reference against during construction of the neck. Fretting after carving is only more awkward when you're hammering frets in, if you're using a fret press or a fret caul in a drill press, then it doesn't make much difference. But a round neck caul makes life easier to hold it steady if you carved prior to fretting. One argument for carving first - if there is any movement in the neck after carving, you have the option to correct it on the fret board before hammering frets in, but that will never be a problem if you're making a laminated neck. Onto the next problem to think about - the tenon joint. I have attached an image of my current dimensions, would appreciate if anyone can just skim over it to see if they are sensible (I made them myself, no template). Thank you! Nice to know I'm getting the hang of it haha, I am very excited for build 2 where I can just go wild and not quadruple check each step.